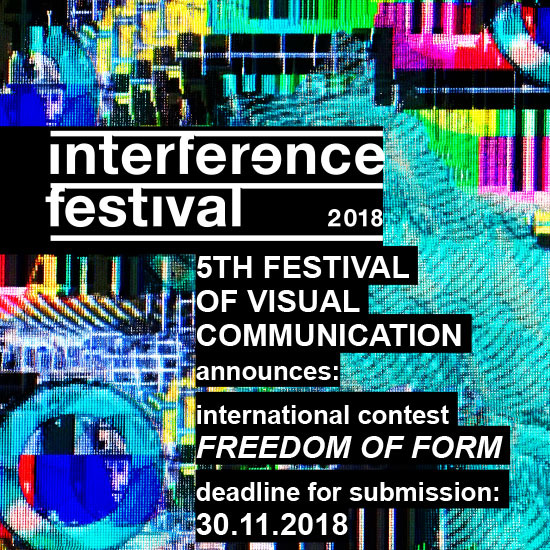 Interference Foundation – the main organiser of the Interference Festival of Visual Communication Forms in Gdansk – is pleased to open the contest “Freedom of Form”, inviting entries of visual works in one of two main categories. The international contest has an open formula - it is addressed to individual authors as well as companies, legal persons, organisations, institutions, and artist collectives. The main aim of the contest is to select the best, the most aesthetically and creatively outstanding short visual works. Another aim is to collect works representing a broad spectrum of visual projects for presentation at the festival. The contest also aims to facilitate the presentation and promotion of young artists’ work. - Experimental Short Visual Form. A condition in participating in the contest is filling in a submission form and transferring the film to the contest serwer. Submissions will be accepted till 30 November 2018 [till 12AM UTC+02:00]. Every entity / person is allowed to enter two works maximum, with the proviso that every work is submitted to a different category. It is not possible to enter the same work in more than one category. Only entry works made in 2016-2018 will be considered. To get more information about the contest you can write to us at [email protected].